We’d love your help. Let us know what’s wrong with this preview of The Faraway North by Ian Cumpstey. These ballads convey a fantastic vision of the world as it was imagined in medieval Scandinavia, with monsters and magic intermingled with very human concerns of heroism, tragedy, love, and revenge. The great hero Sigurd is joined in this collection by troll-battling warriors including Holger Dane, Orm the Strong, and others. There are dramatic scenes of romance, betrayal, These ballads convey a fantastic vision of the world as it was imagined in medieval Scandinavia, with monsters and magic intermingled with very human concerns of heroism, tragedy, love, and revenge. To ask other readers questions about The Faraway North, please sign up. All of the ballads in this translated collection carry a similar theme. The hero, the villain, a maiden. The undying love and battles fought. The ballads are quite short and if as a reader you wish to be handheld through the story, some bits may be confusing to you. For example, the dialogue is not ‘labeled’ and at times you’ll find a good chuck of action didn’t occur. One minute you’re reading how the hero sits on a horse ready to fight a troll and the next minute you’re conversing with the mai All of the ballads in this translated collection carry a similar theme. The hero, the villain, a maiden. The undying love and battles fought. The ballads are quite short and if as a reader you wish to be handheld through the story, some bits may be confusing to you. For example, the dialogue is not ‘labeled’ and at times you’ll find a good chuck of action didn’t occur. One minute you’re reading how the hero sits on a horse ready to fight a troll and the next minute you’re conversing with the maiden after defeating the troll. It didn’t cause an issue with me. I just read and the overall setting and scene was what counted in the end. Overall, I truly enjoyed this collection. Majority of the ballads are in rhythm and rhyme. Translating texts can cut and chop a lot of the beautiful language, meaning and feeling out of the original, but in this case I was still able to get quite a full-bodied picture and result. Ian Cumpstey has produced three collection of translated Scandinavian folk ballads. In this collection, entitled 'The Faraway North,' are ballads with themes of fighting for honour and love, with particular emphasis on Christianity, and on the unspoiled virtue of young maidens. 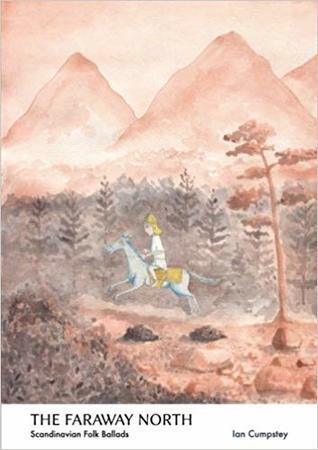 This particular selection of ballads chronicles various heroic quests, such as those involving knights rescuing damsels from mythical beasts, suitors vying for the hand of a maiden, as well as those undertaken by legendary Ian Cumpstey has produced three collection of translated Scandinavian folk ballads. In this collection, entitled 'The Faraway North,' are ballads with themes of fighting for honour and love, with particular emphasis on Christianity, and on the unspoiled virtue of young maidens. This particular selection of ballads chronicles various heroic quests, such as those involving knights rescuing damsels from mythical beasts, suitors vying for the hand of a maiden, as well as those undertaken by legendary heroes, e.g. Sigurd the Dragon Killer, and Sven Felding. The Christian men are painted almost as Saints, while the mythical creatures seem to be the personification of all that is evil. However, one could also infer that the Christian men are the devil in a guise, waiting patiently to strip young maidens of their innocents, while these 'monsters' seek mainly to protect instead. This collection includes beautifully tragic scenes that are well written and will probe at your heart. Ian Cumpstey has done a marvellous job of translating these ballads into English so that countless others may go on to enjoy them. The Faraway North is a collection of traditional Scandinavian ballads introduced and translated by Ian Cumpstey. It’s a huge and frankly impressive undertaking, and it’s obvious from the list of references that an enormous amount of work went into the translations. The introductions are clear and sometimes entertaining in their own right due to to the author’s wry sense of humor, and the topics are pretty much what you would expect if you’re familiar with the subject matter – warriors battling t The Faraway North is a collection of traditional Scandinavian ballads introduced and translated by Ian Cumpstey. It’s a huge and frankly impressive undertaking, and it’s obvious from the list of references that an enormous amount of work went into the translations. The introductions are clear and sometimes entertaining in their own right due to to the author’s wry sense of humor, and the topics are pretty much what you would expect if you’re familiar with the subject matter – warriors battling trolls, rescuing maidens and collecting hauls of gold. I enjoyed the translations quite a bit – while as an English speaker I can’t talk with authority about the quality of the translations, it seems to me that effort was made to keep the metre true to the original works, although in some cases this can result in a little bit of awkward repetition and rewording. However, from the extensive notes included I’m confident that every effort was made to remain as faithful to the source material as possible. It’s also worth noting that a lot of the ballads are honestly great fun to read, and if you have an interest in the subject it’s very cool to get an idea of the influence of Christianity and the outside world on medieval Scandinavia. The introductions were nicely done, and gave a good amount of context to each following ballad while leaving them open enough to a little interpretation from the reader. One thing I will say is that I understand Cumpstey’s choice to keep it focused and somewhat objective from a purely academic viewpoint, but I’d perhaps have liked to get a more personal look at his interpretations and general excitement about the subject matter. In the moments that his personality comes through, the book really shines. This collection didn't feel quite as fun to me as his previous collection, Warrior Lore. I think maybe because it was longer or because the themes and subject matter interested me less; I generally prefer Norse stories to Germanic tales of chivalry. Regardless, this is another strong and valuable collection that is a delight to have. The Faraway North is a collection of Scandinavian folk ballads introduced and translated by Ian Cumpstey. They range from Danish, to Swedish, to Norwegian. As well as tales of trolls, daring, and wit. There are fifteen translated ballads. The amount of work that went into these translations is commendable. He includes a list of resources in the back index, showing that he translated the ballads often from multiple sources. The organization is also another fantastic thing about this collection. Eac The Faraway North is a collection of Scandinavian folk ballads introduced and translated by Ian Cumpstey. They range from Danish, to Swedish, to Norwegian. As well as tales of trolls, daring, and wit. There are fifteen translated ballads. The organization is also another fantastic thing about this collection. Each successive ballad feels like a natural progression. There is quite a range in topics, too, but we also get to see some of the similarities between seemingly different ballads. For example, phrases like "red gold" appear often throughout the collection. It is interesting to see how this multitude of ballads uses similar language while telling different tales. While there is a range, nothing feels out of place. The translations themselves are readable, while keeping with the style of the originals, including rhyme, repetition, and meter. I personally feel like sometimes the wording suffered in order to fit in a rhyme; however, these were few and far between and didn't at all affect my enjoyment of the collection. My only real qualm is with the introductions. I wanted more than just, "Here is what the ballad is about." And we got that on some of the ballads, such as the introduction to the last four. But sometimes I felt that some of the introductions were there out of necessity (i.e., because every ballad had to have one), but they didn't add anything new (insight, translation method, something about the culture, etc.) to the ballad itself. All in all, this is a great collection of Scandinavian folk ballads. If you need some good ol' fashion trolls in your life, give this book a try. Tales of heroics and romance with a touch of paranormal! Throw a few trolls in the mix for added bonus, and this is a fantastic collection of ballads. Accompanied by brief inserts of history before each ballad, The Faraway North provides a fluid and fantastic reading experience! Book review: I was very excited to be asked to review this book. Since both I and my husband share a Scandinavian heritage, it was personally a delight to read tales of the men and women who lived (or might've lived) on those northern shores. Before this, I had only the most cursory understanding of Norse myths, though I have read Tolkien's edition of Beowulf, and this proved to be a great book for broadening one's knowledge of the folk tales that could've been shared and told by my ancestors. He Book review: I was very excited to be asked to review this book. Since both I and my husband share a Scandinavian heritage, it was personally a delight to read tales of the men and women who lived (or might've lived) on those northern shores. Before this, I had only the most cursory understanding of Norse myths, though I have read Tolkien's edition of Beowulf, and this proved to be a great book for broadening one's knowledge of the folk tales that could've been shared and told by my ancestors. Here's a closer look at the Narration, Content, Characters, Artwork, Worldview, and my Overall Response. Narration: 4 out of 5. Since this is a translation, there's not a lot of leeway in the narration, but I would've liked a little more information about the original ballads. Were they meant to be sung or chanted, and was there some kind of rhyming structure in the native languages? The introductory notes were very helpful, as was the content at the end about ballads in general, but I felt like there could've been a great deal more (of course, coming off Tolkien's Beowulf, I was probably expecting more scholarly and technical information than most readers). Content: 5 out of 5. I'm not sure what other selections could've been included, as this was my first introduction to Norse ballads, but I liked the range of tales. The collection includes pseudo-historical stories, tragedy, revenge and conquering love, an almost paranormal/mystical ghost story, and even a rather feminist tale where the maiden defeats her would-be seducer and murderer. Characters: 4 out of 5. Even though there's very little characterization in stories this short and tales from this time, in general, the different people in the stories seem unique. There are strong and weak women, foolish and sensible men, wicked and somewhat neutral trolls, kings and lovers and mothers and daughters, none of whom felt identical to each other (save for some of the weak women whose only role was to be rescued, but there weren't that many of those). Artwork: Subjective. I liked the cover, as some aspects of the two-dimensional drawing reminded me of the Bayeux tapestry or some kind of cave drawing. It wasn't as "Viking" as it might've been, but I thought it reflected the overall feel of the anthology, which features a great many people going places, seeking or running from something. Overall Response: 16 out of 20, or an average of 4. Anyone who has studied Norse ballads will probably find the introductions unnecessary, but as a beginner's place to start, I felt this book does a good job of giving us a taste of the stories of the north without being particularly scholastic or technical. I'd recommend it to those who like folk tales or historical ballads, and especially to anyone with a Scandinavian heritage. For more reviews like this, click here. Note: I received a copy of this work in exchange for a free review. Oh how I loved reading through this. The Medievalist in me delighted at these short and catchy ballads. Ian did a great job at translating them in a way where repetition, rhyme, and rhythm all seemed to be in tact. Being no expert at Scandinavian, I cannot say how faithful the translations themselves were to the original text but, based upon the notes provided I am inclined to trust that Ian is knowledgeable about the language as well as the lore surrounding these Medieval Ballads. The introducti Oh how I loved reading through this. The Medievalist in me delighted at these short and catchy ballads. Ian did a great job at translating them in a way where repetition, rhyme, and rhythm all seemed to be in tact. Being no expert at Scandinavian, I cannot say how faithful the translations themselves were to the original text but, based upon the notes provided I am inclined to trust that Ian is knowledgeable about the language as well as the lore surrounding these Medieval Ballads. The introductions accompanying each ballad did a good job of setting the scene for the events about to transpire. There were plenty of times that, without those introductions, certain details or events might have been overlooked upon a first read because they appear in allusions or in fast-passing moments during the ballads. So those introductions are perfect companions to each ballad in this collection. There are a lot of similarities with these ballads and the literature of the Anglo-Saxons and the Icelanders, the two areas of Medieval literature that I am most familiar with. After reading this collection, I feel a level of comfort in expanding my interest to Scandinavian literature from that period as well and look forward to uncovering more literary treasures and seeing what else Mr. Cumpstey has to offer. I cannot express enough how wonderful this short collection of ballads was to read, and highly recommend them to anyone with an interested in literature from medieval cultures or even fans of fantasy. I was provided a free eBook copy of this in exchange for an honest review. If you like folklore and mythology this is a great little read. It is educational and entertaining. There are tons of characters all of whom get into their own little trouble/story. Some are tragedies, some are comedies, but they all are interesting. I really appreciated that the author explained what was happening before the ballad. It really helped a layman, like myself, understand what was happening. There was also an introduction at the beginning and a summary of i Actually 4.5 stars. If you like folklore and mythology this is a great little read. It is educational and entertaining. There are tons of characters all of whom get into their own little trouble/story. Some are tragedies, some are comedies, but they all are interesting. I really appreciated that the author explained what was happening before the ballad. It really helped a layman, like myself, understand what was happening. There was also an introduction at the beginning and a summary of information at the end. It was very educational but wasn't boring. I read a ballad or two a night before bed since they were so easy to read. I really enjoyed this but a few of the introductions were lacking and I had to read one of the ballads twice to really understand what had happened. Despite that, it was a fantastic little read! I hope this author does more. These Scandinavian ballads are colorful and captivating. They will appeal to all ages. They provide especially good material for introducing poetry to young people and offer a culturally meaningful divergence from Harry Potter. More than that, however, they are a scholarly achievement reflecting a great deal of professional work. Cumpstey prefaces each one in a readable and scholarly manner. His translations are all the more impressive for keeping a lyrical tone. A literary type will find the boo These Scandinavian ballads are colorful and captivating. They will appeal to all ages. They provide especially good material for introducing poetry to young people and offer a culturally meaningful divergence from Harry Potter. More than that, however, they are a scholarly achievement reflecting a great deal of professional work. Cumpstey prefaces each one in a readable and scholarly manner. His translations are all the more impressive for keeping a lyrical tone. A literary type will find the book useful as a starting point to better understand and research the history of the genre. He successfully grafts the academic to the entertaining. I received a free copy of this book in exchange for an honest review. It’s been a while since I’ve read a collection of ballads, so I figured I was well overdue for one. I definitely did not regret this read! It gave a fabulous insight into the Scandinavian Folk Ballads, something I had never gotten to read much of before. I'm 19, and I highly recommend this collection.